If you’re looking for the perfect Columbia River Gorge day trip from Portland that includes stops at Hood River and Timberline Lodge, put the ‘Fruit Loop Tour’ on your list now. I didn’t hear the words “Fruit Loop Tour” until a good few months into my time in Portland. My boyfriend heard a few locals at his work talking about it and he suggested it would be a great day away from the city – I mean who doesn’t love a good ol’ Columbia River Gorge day trip? When he told me all that it involved – Portland to Hood River and Mt Hood, in addition to the Columbia River Gorge, I was so in. It sounded like the most quintessential day trip from Portland I could think of. Think of the Fruit Loop Tour as a scavenger hunt of sorts, a challenge to see the best of the Pacific Northwest wilderness all in one Portland day trip. This road trip from Portland includes three stops in total – the famous Columbia River Gorge, Hood River, and Mt. Hood. 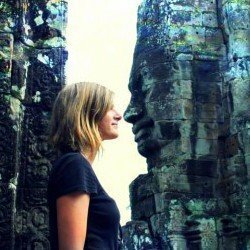 Could you think of a fuller and more exciting day trip? No, I didn’t think so. 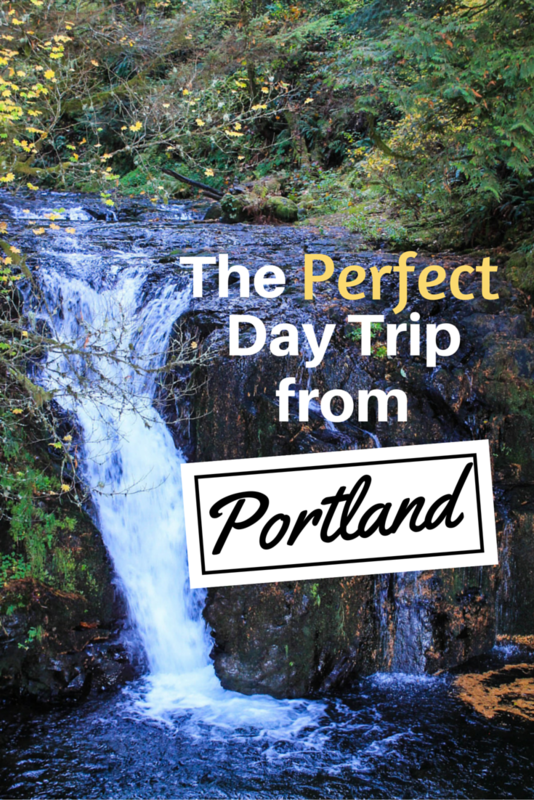 This has to be one of the best day trips from Portland, Oregon. I believe the original fruit loop tour consisted of 36 short stops at fruit stands, orchards, and wineries around the Hood River area, but it has become something else altogether for some Portland locals. Although that fruit loop tour is still a viable option in the right season, I much preferred the one we did. It’s a better variety of scenery and ultimate Pacific Northwest sights that are beautiful to see no matter what time of the year it is, making it one of the best winter day trips from Portland, Oregon and one of the best summer day trips from Portland. There’s nothing better than stunning views like this on a Columbia River Gorge day trip from Portland. The Hood River, Mt Hood and Columbia River Gorge Day Trip from Portland – aka the Fruit Loop Tour! If you’re only in Portland for a day and want to explore outside the city or looking for a fun outdoor adventure to add to a Portland, Oregon weekend trip, you have to tackle this Hood River, Mt Hood and Columbia River Gorge day trip from Portland in all of its exhausting glory. You will not be disappointed. I think the trip in total took us about 12 hours, so make sure you have the stamina for it. Also, if you’re a local Portlander and you haven’t done this tour yet – get on it! You may have already been to all of these sights individually, but it’s different when you see them all in a day and can compare them with each other. This drive is, in my opinion, one of the most scenic drives in Portland, Oregon. The views alone are worth combining these epic stops into one of the most fun day trips in Oregon. Feel free to mix this Portland day trip itinerary up and add or take away whatever sights or scenes you’d like to include in your own trip. This is just a basic framework to get you out and exploring the Pacific Northwest. Only about an hour’s drive from Portland, Multnomah Falls and the Columbia River Gorge as a whole are potentially the most popular escapes from Portland. 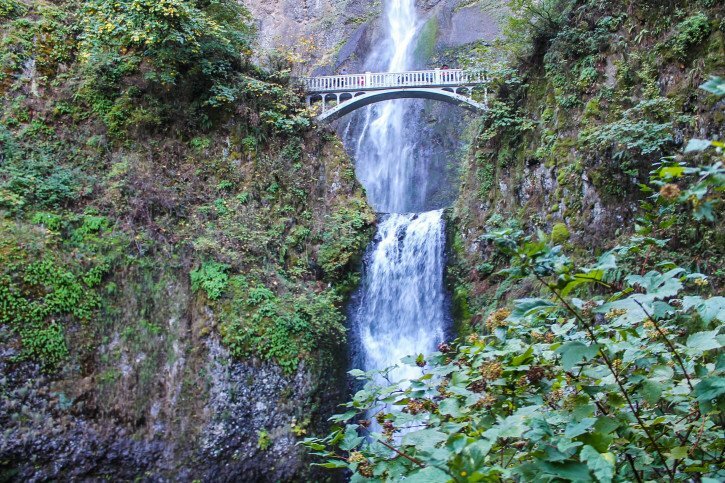 Multnomah Falls is the waterfall you see in every picturesque postcard. It’s what every traveler wants to put on their Columbia River Gorge itinerary during all of their Portland day trips, and even though it’s generally a crowded spot, it’s well worth adding it to any day trip from Portland. At the top of any Columbia River Gorge itinerary? Multnomah Falls, of course. We hiked up the relatively short distance to the top of the 620 foot waterfall during our Fruit Loop Tour to get a glimpse of what it felt like to look down instead of up from that view. If you have the time (although for this particular tour you should only really be spending a few hours in each stop), I’d recommend seeing a couple of other waterfalls while you’re in the area. If you don’t have a lot of time on your Fruit Loop Tour but are spending more time in Portland consider going on more day trips from Portland, Oregon and coming back and exploring more waterfalls. It’s the Pacific Northwest, after all, and a Columbia River Gorge day trip is not complete without an abundance of waterfalls. The waterfalls along the Columbia River Gorge are numerous and often quite close together. Many of them don’t have long walks or hikes from the parking area, or they’re simply right along the road as you drive by. A couple of my personal favorites are Latourell Falls and Horsetail Falls if you’re short on time and want to round out your Columbia River gorge itinerary. 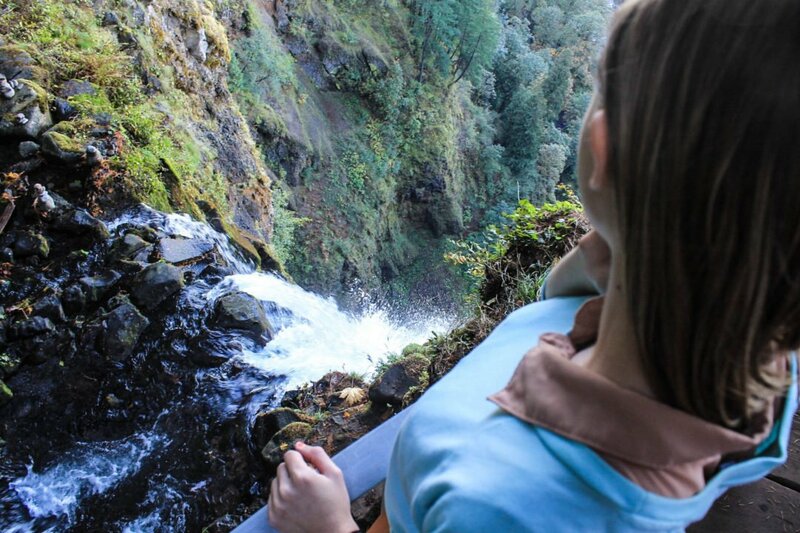 The goal on any Columbia River Gorge day trip is to see as many waterfalls as possible. Go! Of course, the Columbia River Gorge is worth a full day (or many) when you have the time to explore the vast amount of trails hidden within the forest, but for the sake of the Fruit Loop Tour and the many wonders you’ll see in a day, a few hours in the gorge will suffice. Another 40 minutes down the highway and you’ll come to Hood River, your second stop and halfway point on the Fruit Loop. Our tour was the first and only time I’ve visited Hood River, a charming city along the Columbia River Gorge that’s both welcoming and attractive. They hold their own in terms of a local craft beer scene, and it’s generally recommended on any Hood River day trip that you make a stop at Pfriem – arguably the most popular brewery in the area. 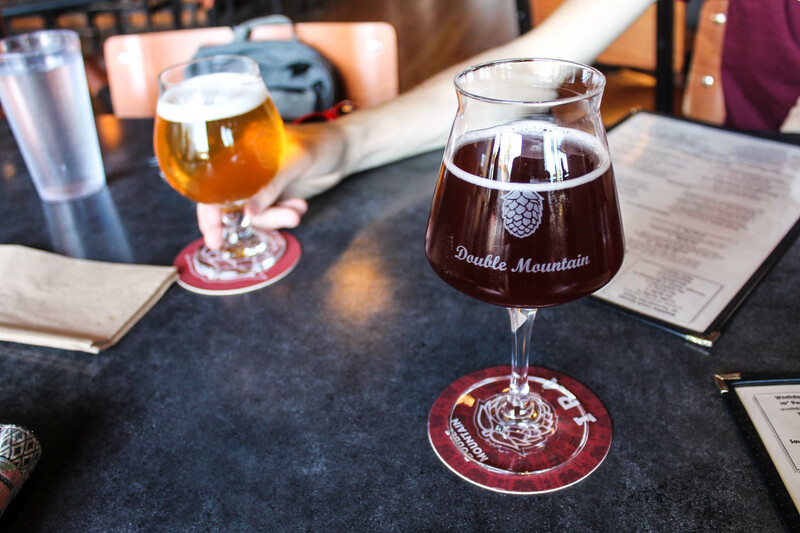 Although we didn’t make it to Pfriem for this trip, we did have a chance to visit Double Mountain Brewery, which had a whole lot of country music and a very local feel to it right in downtown. They had a tasty Flanders Red ale that I sipped on with lunch. Full Sail is another popular brewery in Hood River, right next to Double Mountain, and worth checking out if time permits. A Hood River day trip should include beer. Lots of craft beer. Hood River is a fun city to walk around and pop your head into all the small boutique shops in town. There is a much slower pace here than Portland, so it came as a welcome retreat from the hustle of our current base. 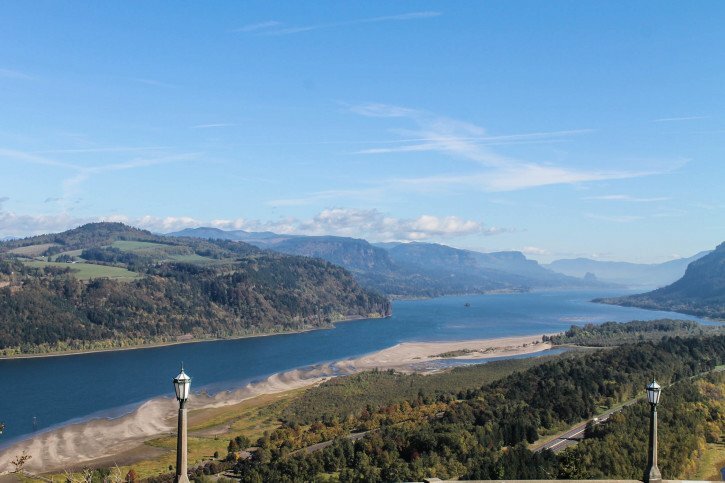 It’s also known for being a great windsurfing location when the weather is nicer, so if you’re into that at all, make sure to keep another Hood River day trip in mind! Note: If you’re short on time (i.e. you only have a half day), I’d recommend skipping Hood River out of these three and going straight from Multnomah Falls to Mt Hood for the most impressive sights. The distance from Multnomah Falls to Mt Hood is about 68.2 miles and takes about 1.5-2 hours. If your visit to Portland is very short and you don’t know which Portland, Oregon day trips you should enjoy, I recommend driving straight from Portland to Mt Hood, so you still get to enjoy the MT Hood Loop. 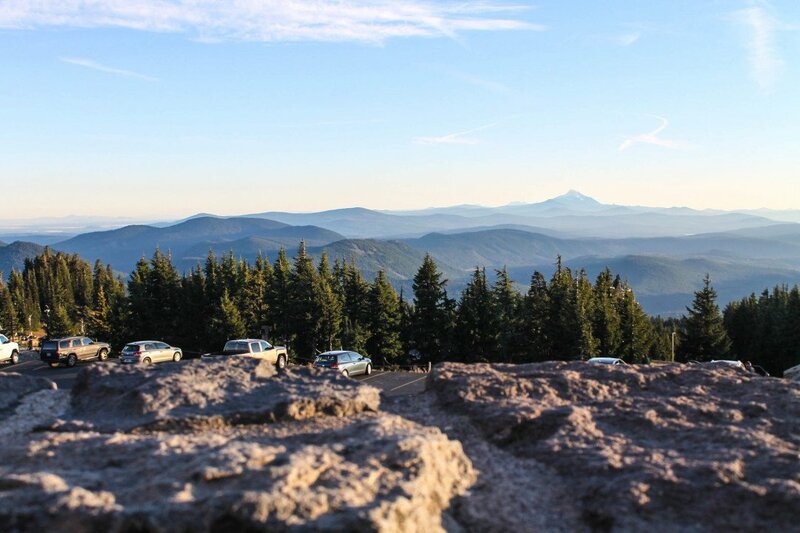 Lastly, the perfect way to end your Mt Hood day trip from Portland is at the historic Timberline Lodge. 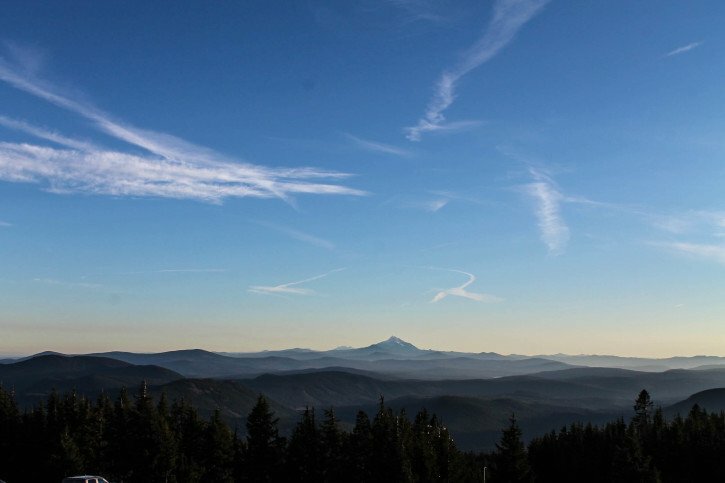 A Mt Hood Day Trip from Portland is a must if you’re in ‘Stumptown’ for more than a few days. Visiting Mt Hood and The Timberline Lodge never gets old, the view is always different as well as the vibe whenever I’m up there. We finished off our Mount Hood day trip with a fancy dinner at their restaurant, looking out over the ridges of the mountain. 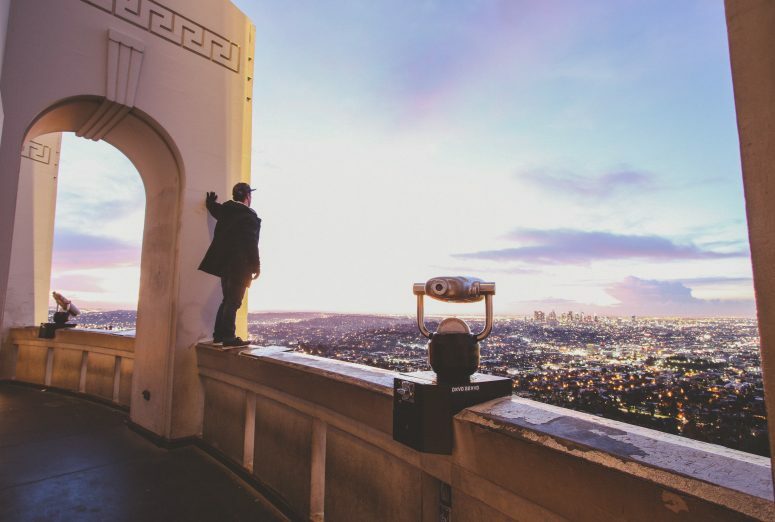 It was a stunning place to watch the sun go down and enjoy the brisk fall breeze from the second-floor balcony. Mount Hood day trip views. Always beautiful. Although the slopes weren’t open yet when we were there towards the end of fall, Timberline is a popular local spot for skiing and snowshoeing in the height of winter if you’re looking to do another day trip to Mount Hood. 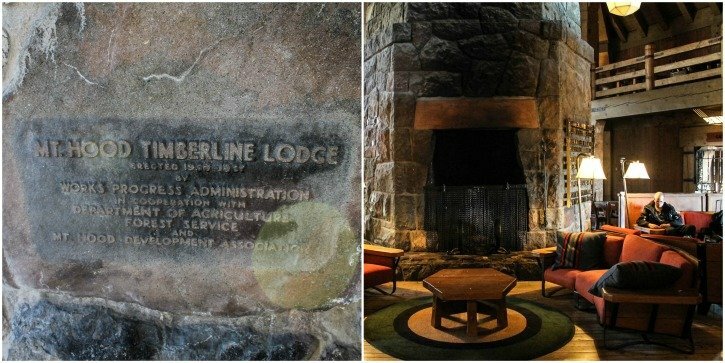 If you want to plan weekend getaways from Portland, consider staying at Timberline Lodge. Their amazing slopes and luxurious amenities will make the perfect location for all sorts of weekend trips from Portland. When you are finished admiring the beauty of Mt Hood, jump back into your car and enjoy the drive back to Portland along the Mt Hood Loop. Don’t miss out on this ultimate Portland road trip – The Fruit Loop Tour! And that, ladies and gentlemen, is what I would call the ultimate Portland day trip. It may not seem like a lot of stops or a trip that would take 12 hours, but there is SO much to see in this beautiful area of the Pacific Northwest. I think it would be hard to be disappointed with what you find there. The Fruit Loop Tour is definitely one of the best day trips from Portland. Have you been to any of these spots in the Pacific Northwest? You may not realize this, but Portland has a super seedy history. On this two-hour walking tour, you get to learn all about the city’s history with corruption, gangsters, and its role with the Shanghai Tunnels. This is one of the best Portland day tours for the history buff who likes to get an alternative perspective to a city than just the usual sights. Portland is known for its food trucks and fusion foodie scene – and really you can’t come to Portland and not sample of its unique flavors and dishes around the city. This two-hour walking tour takes you to 7-9 of the city’s most famous food trucks – from Cajun food to Chicago style. Just make sure to come hungry! (Don’t worry, you’ll walk it off). If You don’t have time to do the whole Fruit Loop Tour, the Columbia River Gorge is still worth a visit! It’s the most popular area to see outside of Portland. 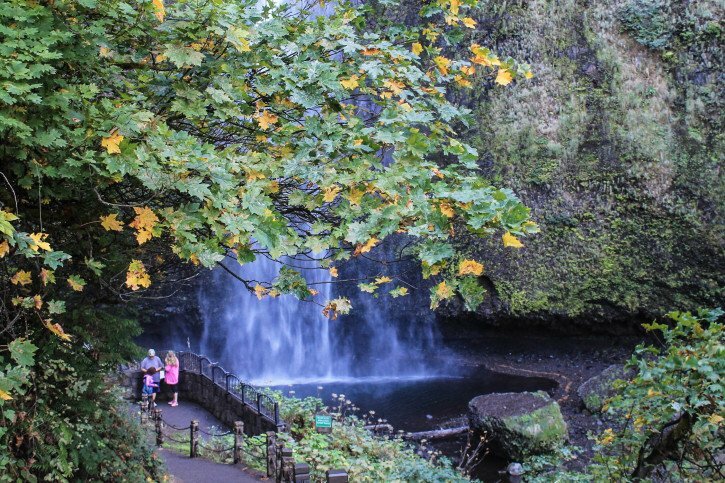 Explore this beautiful lush area with the help of one of the top-rated local Portland tours that will take you to the best waterfalls and fresh trails that the Pacific Northwest is so famous for. You’ll visit sites such as the Portland Women’s Forum, Crown Point Vista House, Latourell Falls, Multnomah Falls, and Horse Tail Falls. It’s a good overview of the Columbia River Gorge if you only have a half-day to spare. NEED HELP PLANNING YOUR TRIP TO PORTLAND? FIND INSPIRATION FROM THESE BLOG POSTS! 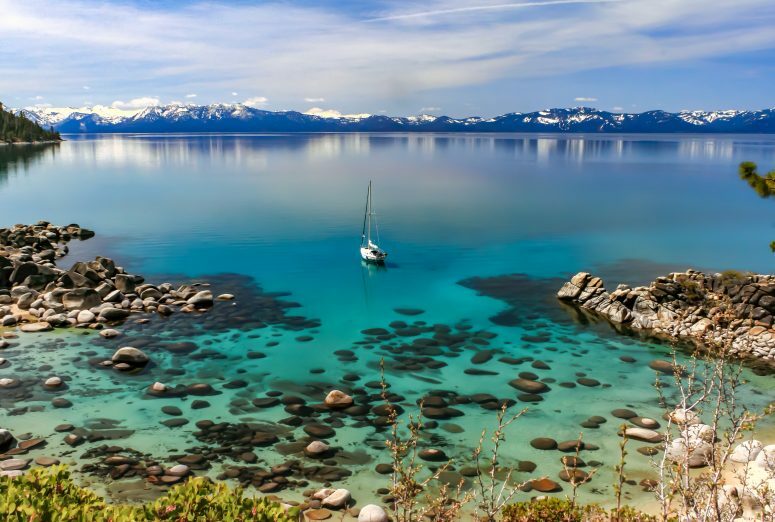 This looks like a perfect day trip! Words cannot describe how much I love Oregon and Portland! I wish so badly we could live there! I love hiking up Multnomah Falls; next time you should look into doing the Oneada Gorge hike; it’s just down the road from the falls and is the most beautiful place I have ever seen! That’s awesome Chelsie, it is a very beautiful spot in the States to be sure! I want to do Oneonta Gorge so badly, we were going to a couple of weeks ago but it was raining and cold, not great conditions for wading through gorge water – looks like a great one to do in the summer though! Pacific Northwest nature is so lovely to get lost in, even with all of the rain. Thanks for reading Rosalyn! Thanks for the tips. 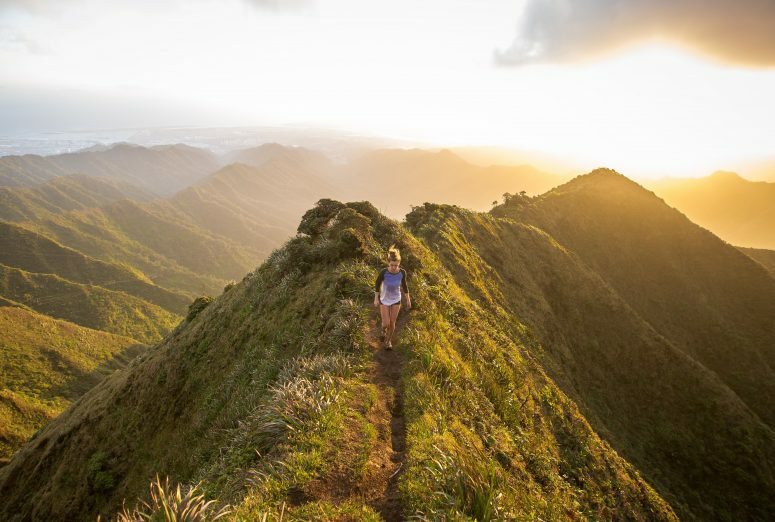 We are headed to Portland next month, and will be sure to visit the Columbia River Gorge – can’t wait to see the waterfall, and now to walk to the top. That’s awesome Rhonda, let me know if you want to meet up for coffee while you’re here. I’d be happy to give you some more recommendations. The Columbia River Gorge is ahhmazing, so worth the day trip from Portland. This is sooo great! Thank you for posting this… I’ll be there next month and i can’t wait! I’ll definitely do this Fruit Loop Tour.